Advent of 4K and 8K media has been great for the consumer perspective. Consumers are not willing to pay extra for the added clarity higher resolution media provided. After the transition from analog to digital cameras the amount of content ingested on to the broadcast ecosystem has spiked. The spike doesn’t seem to taper. When HD was foreseen as the future of media, 4K came in, in no time now we are talking about 8k. The following chart shows the approximate media size across different video resolutions. Higher resolution needs higher processing, modern computers are equipped with multiple processors and cores, rendering of video is optimized by multi-threaded processing, thus enabling the processing of such high bitrate media. So processing is just coping up with the latest resolution formats. However, storage media especially Hard disk based storage hasn’t scaled up as fast, this has turned out to be a major bottleneck in media houses. There is too much media to store and the demand for storage solution to cater to this influx of media is growing day by day. There is no universal solution to tackle this problem. The right choice of storage media and the Archival Software solution can provide long term scalability and huge cost savings. In this article let’s try to list out various storage options their suitability for various broadcast scenarios. 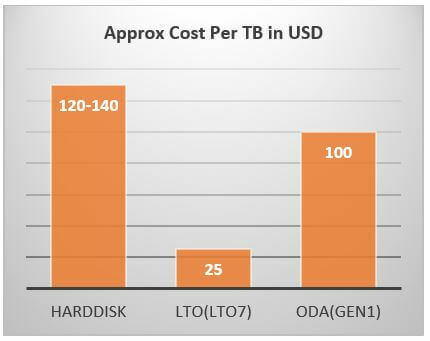 The following chart shows the cost per TB graph of traditional existing Archival Storage Solutions. In the past 5 years there has been a massive paradigm shift towards Cloud as an Archival storage. Its selling points such as unlimited Scalability, vendor agnostic, storage in different geographical areas are hard to ignore. 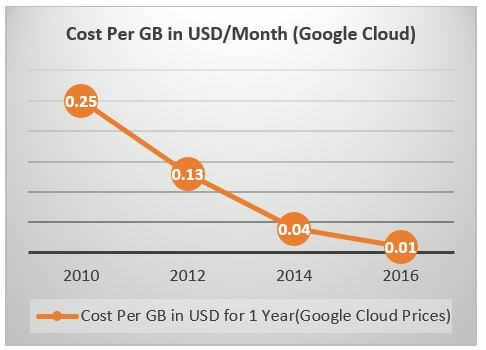 The cost per TB of cloud based storage is coming down rapidly. The drop closely resembles the Moore’s law with costing being halved every 15-18 months. Considering that the on premises storage cost is just around 1/3rd of the actual archival costs, other costs for cooling, power, manpower almost are 2/3rd the archival setup cost. Cloud as a cost effective archival media has come dramatically close to traditional storage media and by the current trends will be the choice of archival media in the coming years. The following graph shows the Cloud Storage Costs per GB over the years. Notice the brisk fall is costing. So which Storage Media is right for you? In News workflows the time available for retrieval of the required media from Archival Storage is hardly few minutes. The time to air a relevant clip can make or break a story. Under such scenarios where speed is the main criterion – Hard disk based storage is still the king. While hard disk based storages can easily scale to GBps of throughput easily, the alternatives are limited by their throughput capacity. However even with the best raid techniques reliability of hard disks has been a concern, hence a proper backup solution for Hard-disks has to be in place. LTO and ODA both are good backup media solutions for news workflow. 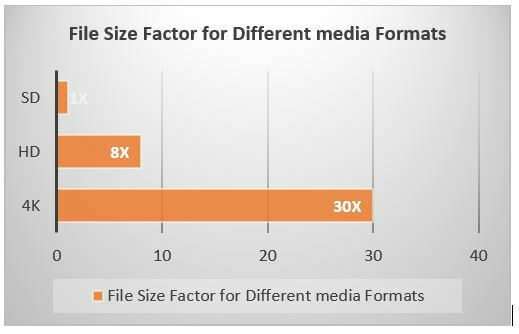 ODA can be faster for small media files due to its faster seek times. But for bigger files there is nothing much to choose between the two in terms of speed. The retrieval time for media in non-News environments such as Entertainment Channels is quite relaxed. Throughputs and speed is not a priority. The file sizes are usually huge and generally multiple copies of media will be stored. Cost effectiveness of storage plays a critical role here. LTO has been the most cost effective storage solution and with LTO7 which gives uncompressed capacity of 6TB per tape, it will be the most cost effective Storage for the next couple of years. LTO isn’t without niggles, data migration to new LTO tapes every few years is a definite annoyance but the cost effectiveness it provides for large amount of data is difficult to ignore. Optical Disc Archival from Sony trumps others in the long term storage department. It promises data retention of up to 50 years and also promises superior performance against data corruption due to water and dust particles. Currently it’s the most logical solution for long term archival. However as on date Sony is the only manufacturer of ODA and the technology is pretty proprietary. If remigration problem of LTO isn’t an issue, LTO still is a very good alternative for long term storage. Cloud storage makes an excellent point for itself for long term storage. 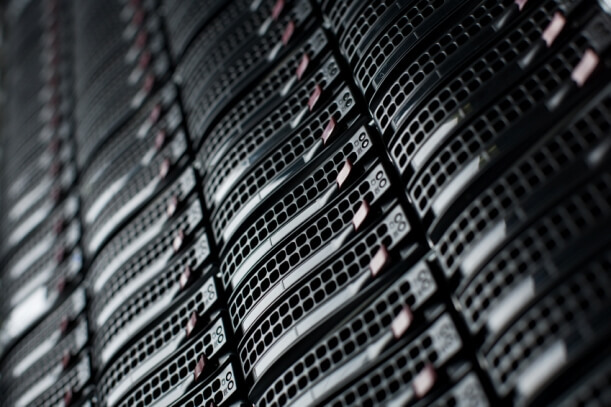 On cloud – as a user you need to be least bothered about the backend storage technology. The content which is mirrored in different geographies gives you the peace of mind and mitigates chances of complete data loss in case of disasters. Across different media verticals Disaster recovery setups are critical from the business continuity point of view. A proper disaster recovery archival solution should be ideally in a different geographical location. But the costs associated with such a system is prohibitive in majority of cases. Cloud storage is tailor made for such requirement. A good cloud storage solution by default comes with its own DR sites with very high availability. Unless the data is highly confidential and you do not believe in the advanced security systems cloud Storages provides Cloud is the most suitable Disaster Management Storage. QuickEdge MAM and Archival Solutions versatility comes from its tight integration between different storage medias. With its industry leading Multi node cluster architecture and integrations with leading transcoding and Quality Check and correction solutions QuickEdge MAM provides the most complete Archival Solution. DataHeart HSM plugin leverages the near line storage capabilities in sync with everyday usage scenarios whereas the QuickEdge MediaWorker interacts with online Media.